Which Way to the Big and Tall Store!? – Beware the Comfort Zone! Which Way to the Big and Tall Store!? Some good news! I’ve lost weight since arriving in Davao! This phenomenon is fairly common here, it’s a careful blend of sweating, walking, eating fresh local food, sweating more, and probably a lot of stress relief (or maybe added stress for some people? Not for us though!) In my case, the appalling lack of soda helps too. In the States, I would drink 50 to 60 ounces of soda a day. Not proud of that fact, but it was part of life. I reasoned that it was diet, so not as bad, even though I have read countless articles that argue otherwise, many in fact claim it’s worse. OK, enough of the past, I’m basically soda free today, yay! I still have a ways to go, even by American standards I lean towards the “fluffy” side, but yay for progress, right!?! 20 some odd pounds later, I finally decided that I should pick up a few new pieces of clothing, the old stuff fit, but boy I looked sloppy, and it didn’t appear as though I had lost anything. I have heard stories of white girls shopping in Asia. Horror stories of shame and humiliation, digging through the back of the racks to find something, anything, that would fit. Or worse, having the 70 pound salesgirl dig thru the back ROOM for larger sizes that they keep hidden in the back, probably in a vault labeled “for chunky white girls who weigh over 110 pounds”. Now, a bit of chunk is actually attractive here. Revered almost. I have been called “beautiful” more times here than the entire time I lived in the States. Do the math. I’m a rock star here! Um, well OK, not quite, but close. Yet, western glossy magazines with skinny, twiggy girls on the covers have begun to weasel their way into the culture and on the news stands, and I fear the days of “big is beautiful” are numbered. So anyways, the day I was in a particularly good mood, and had a “happy body image day”, I decided to go shop, armed with self confidence and the knowledge that it might not be a successful outing. We went to SM Mall here in Davao, which has a large percentage of white patrons, so I thought it would be a good place to start. I entered the department store, head down, and headed for the women’s section. Suddenly surrounded by an army of size 0.25 salesgirls, I peeked at the racks. “What size ma’am?” one of the girls asked. “I have no idea, and I don’t want you to guess” was what popped in my mind. So, I embraced the humor of the situation and said, “Big”. She laughed, and was actually very helpful, a refreshing change. Something I’ve learned about shopping here…”browsing” is a foreign concept. Everyone comes to the store knowing exactly what they want, size, color, or so the sales clerks seem to think. It’s a pressure packed situation. If you don’t know what you want, they will start finding possibilities for you. Lots of possibilities. No. I don’t want the sequined peacock top. No, not really into pink and orange polka dots with matching bows. Honest…I’m not a fan. I don’t need to see it in green. And no, I will not fit into a size 6 no matter how many times you show it to me. I understand a 6 is mega huge, but you have no idea how big I really am! God love them for trying though! OK, back to the helpful salesgirl. She helped translate sizes, didn’t laugh at me, and helped find some tops that were the right size, and actually…cute! I left with four shirts that I look darn cute in, yay! There’s hope for those of us that wear double digit sizes! Oh, and an added bonus…the sales racks are loaded with bigger sizes, since the group that actually buys them could probably all climb in a jeepney and come shopping together. 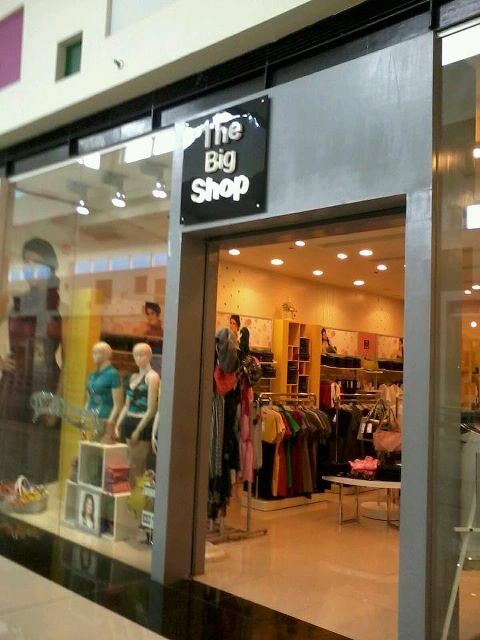 I walked around the mall a bit more, and found “The Big Store”. The store was small, so I will let you infer what was big. Cute stuff, a bit pricey, and I got a kick out of the girls who once again, were about 10 pounds. Overall it was a successful outing, I am looking forward to losing more weight, but not shopping again anytime soon. Next time though, I’ll know what size I am! Hello! I know exactly what you mean about the salespeople. 🙂 I’m living in Nicaragua and have experienced the same thing. Love your blog! Previous Post Happy Trails, Dad! Next Post We Have Wheels!